Legendary Urdu poet and lyricist Nida Fazli passed away in Mumbai on Monday. The 78-year-old Fazli breathed his last at his residence, following a heart attack. 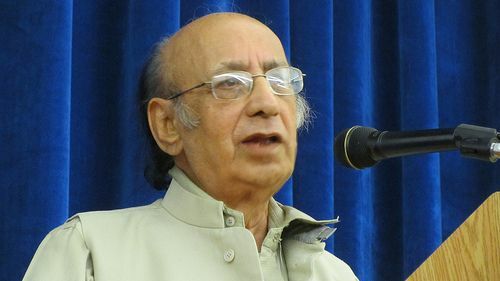 Born in Delhi on 12 October 1938 as Mukhtda Hassan Nija Fazli, he chose Nida Fazli as his pen name. Nida translates to 'voice' in Urdu while Fazli refers to his ancestral place in Kashmir. Fazli's parents migrated to Pakistan during partition, but he decided to stay in India. He completed his graduation from Gwalior College in 1957. Fazli was a born writer and started to show his prowess from an early age. His father was a poet of some repute himself, and even had a poetry collection to his name. The search for livelihood took Fazli to Mumbai in 1964. Fazli began his career by writing for Dharmayug and Blitz magazines. However, his unique poetic style soon attracted the attention of Bollywood and contemporary literary figures. Fazli epitomised the essence of Indian secularism. His expression was influenced by legendary Urdu poets Ghalib and Mir. But, it was mystic poet Surdas that inspired him to take up the pen. It is said Fazli was once passing by a Hindu temple while still young. He heard a singer rendering the compositions of Surdas. The bhajan conveyed Radha's longing for Krishna. The sheer beauty of the song changed Fazli's life forever and a poet was born. Fazli began writing for Bollywood in the 1970s. Though he had become a known face in mushairas by then, success in tinsel town did not come easy. His criticism of contemporary poets in his book 'Mulaqatein' made things difficult for Fazli. Many renowned poets, like Sahir Ludhianvi, Ali Sardar Jafri, and Kaifi Azmi, turned against him. Fazli's first successful break came with the movie Aap To Aise Na The, released in 1980. The song 'tu is tarah se meri zindagi me shamil hai' became an instant hit. The melody sung by Manhar Udhas is still remembered. His ghazal 'Kabhi kisi ko muqammil jahan nahin milta', penned for the movie 'Aahista Aahista', was also an evergreen hit. Fazli also wrote the final two songs for Kamal Amrohi's epic Razia Sultan, as the movie's original lyricist, Jan Nisar Akhtar (Javed Akhtar's father), had died before the film was completed. Fazli never looked back after this success. His soulful lyrics were credited for the success of many films like 'Tamanna', 'Sur', 'Is Raat ki Subah Nahin', 'Nakhuda', 'Gudiya' and 'Sarfarosh'. His mesmeric words created magic when ghazal maestro Jagjit Singh teamed up with him for several albums. The duo had numerous hit ghazals to their name, from 'duniya jise kehte hain, jadu ka khilona hai' and 'Garaj baras pyaasi dharti par' to 'Hoshwalon ko khabar kya'. The legendary poet also had around 24 books to his credit in Hindi, Urdu and Gujarati. These include six poetry collections 'Lafzon ke phool', 'Safar mein dhoop to hogi', 'Duniya ek khilona hai', 'Mor nach', 'Aankh aur khwaab ke darmayan' and 'Khoya hua sa kuchh'. Some of his books are part of the school curriculum in Maharashtra. In addition, Fazli wrote for TV serials like 'Sailaab', 'Neem ka Ped', 'Jaane Kya Baat Hui', and 'Jyoti'. He also wrote columns for several magazines and websites on contemporary issues and literature. Fazli has dozens of awards to his name. He was honoured with the Sahitya Akademi award in 1998. The colloquial lyrics for the movie Sur won him a Star Screen Award in 2003. The Government of India awarded him with Padma Shri in 2013. In addition, Fazli was recipient of National Harmony Award for writing on communal harmony. He received the Mir Taqi Mir award for the novel 'Deewaron Ke Beech' from the Madhya Pradesh government. READ NEXT >> Controversial Smriti, firebrand Yogi or motormouth Mahesh. Who'll be BJP's face in UP?